1. French election: It's time for the French to decide on their next leader: centrist Emmanuel Macron or the far-right National Front rival, Marine Le Pen. The two bubbled to the top in a heated race that's coming to an end on Sunday. The polls indicate that Macron is expected to beat Le Pen, although nothing is certain in politics anymore. But investors are hoping they're correct because global markets rallied following Macron's first-place finish. If he wins again, they'll likely move positively again, albeit in a more muted manner. But if Le Pen wins? 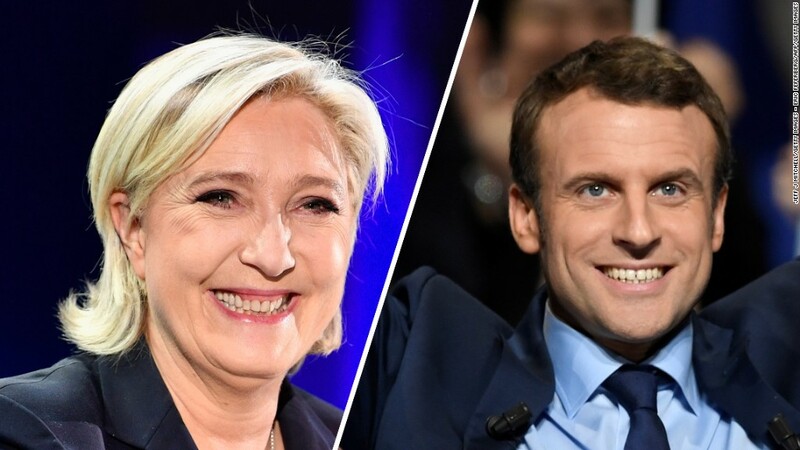 It could produce a strong response from the markets because she wants to bring back the French franc and possibly pull her country out of the European Union. Related: Is Le Pen going soft on threat to quit the euro? 2. More earnings: They just don't stop. This week, it's the media's time to hopefully shine: News Corp (NWS)., Time Inc. (TIME) and Disney (DIS) will report. All three companies have been in the headlines lately due to management shakeups, canceled sales and layoffs. Retail brands, which have been hit hard lately, also report this week: JCPenney (JCP), Kohl's (KSS), Macy's (M) and Whole Foods (WFM). The natural food grocery store previously reported rebounding sales last quarter, but it continues to be saddled with takeover talk. 3. Snap earnings: Snap (SNAP) is reporting earnings for the very first time on Wednesday. The messaging-slash-camera company will use the opportunity to show that it can grow its user numbers and ad money. It's unclear if CEO Evan Spiegel will take part in the call. Snap has a lot to prove. The stock has been on a roller coaster since its March debut. It initially popped in its first week, dipped very low and is now hovering around its opening price. The call will be peppered with questions if it can withstand Facebook's all-out assault and Twitter's reinvigorated push into video.